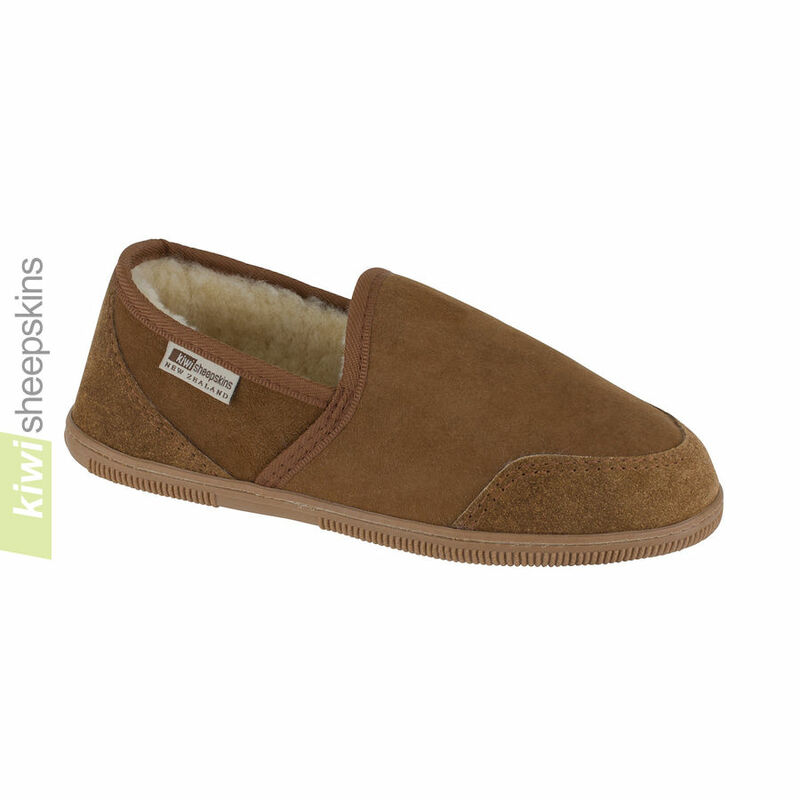 Top-of-the-range mens sheepskin slippers. Top seller in the UK. Durable, ultra-flexible sole & replaceable insoles. Premium quality sheepskin slippers. These slippers generally run about true to size. Delighted customer feedback for these man's slippers. This is just a quick note to say how pleased I am with my new slippers! Here is my brief story. On December 28 I decided to order some new slippers. 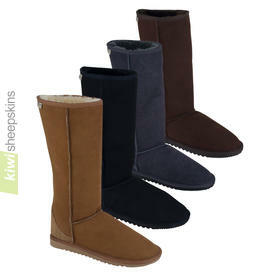 I picked out a pair of sheepskin slippers on the web site of a well-known US company known for top quality. However, when I went to check out, they said I would receive the slippers in the second half of March! 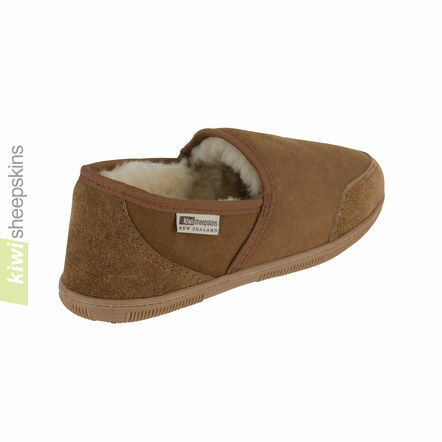 I cancelled the order and searched the internet for another provider of sheepskin slippers and found Kiwi Sheepskins. 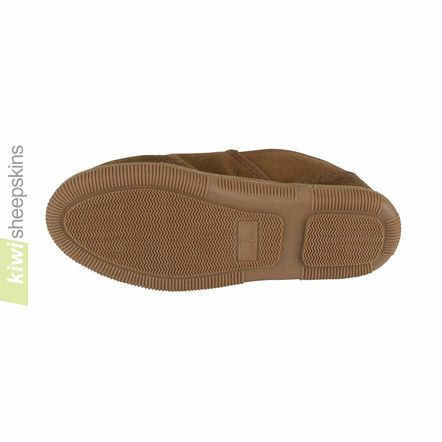 I placed my order and the slippers arrived on January 10 - in less than 2 weeks from New Zealand! I was impressed. The slippers are very comfortable and super warm. My US size 13 slippers were true to size and fit perfectly. They appear to be of very high quality and I look forward to seeing how long they last. I'm glad I found you and anticipate being a repeat customer. First purchased your slippers two years ago for my parents Christmas presents, and have purchased another two pairs for this year. 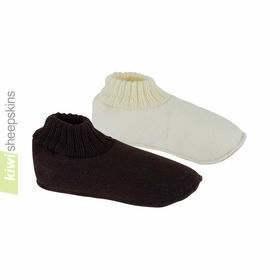 The quality is superb, they fit well and are very warm. Delivery was extremely fast, arriving within a few days of ordering. Very pleased with my purchase - thank you. Mrs P. J. L. H.
The slippers arrived today, perfect fit, warm feet, delighted with them. It's been a bad winter up here, and my tootsies have been numb with cold. My sheepskin slippers arrived this morning, and they are great - my tootsies are now toasty. Definitely the Rolls Royce of slippers. Thanks & best wishes. Your slippers are THE best. This is my third order, with no doubt many more to come! Thank you. My order has arrived in very quick time. I would like to thank you for providing the best online shopping experience I have had. I found your business after trying unsuccessfully to buy from Ugg Australia .....they only sell through the USA.....unbelievable. Your product is quality and your online shopping easy and efficient. Thank you very much. I look forward to shopping with you again. Many thanks for the very prompt delivery of the sheepskin slippers. I would also like you to know that I am very pleased with them and I would put them amongst the very best of all the sheepskin slippers I have previously purchased. This is my second order with you (my partner and I both have sheepskin boots) and the service and quality was as excellent as with the first. The premium slippers are lovely and I'm sure my partner will be thrilled with his Christmas present. 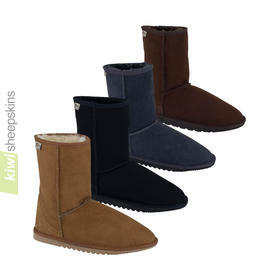 Every time someone I know talks about buying a pair of Uggs I swiftly give them the name of your website and tell them how much better you are! Many thanks. Received slippers today in Scotland. What fast delivery and great service. Slippers are of great quality. I will shop with you again and will also pass on your web page to friends and relatives. Once again thank you for problem free service. I was so impressed with the product that I placed a repeat order immediately. The visual and textual presentation of the product online proved to be totally honest. I received the product in the UK within 5 days. The integrity of the product's craftsmanship is superlative. A FIRST CLASS service as order is delivered and on my feet in 7 days (quicker than some deliveries ordered in the UK). Brilliant and if they wear as well as they are warm I will be very happy. Thank you again and I look forward to ordering other items from you. Greg from Wales. Good morning - just to let you know that the slippers I ordered from you last week arrived this morning. How quick was that? In fact I am wearing them now as I send this email, and they are absolutely superb. Many thanks for excellent service and product. Thank you so much for my order that arrived so quickly. The slippers are a dream on my cold feet, hubby happy too. Please feel free to put this note of kind appreciation of the quality and 1st rate professional all round service you have given me openly for others to read. Your sizing is very accurate too - thank you for the help you gave me with this. I will never buy sheepskin products anywhere else. Hello, my husband has received his size 6 slippers and says he has experienced "absolute perfection"! Thank you. I received the slippers I ordered from your company a week earlier than I expected. Fast. The product quality is perfect. I couldn't be happier with your service and merchandise. Slippers received very promptly & superb quality! Brilliant service - many thanks guys! Got slippers today, 1 week after ordering. Delighted with both quality and service. Its just amazing. 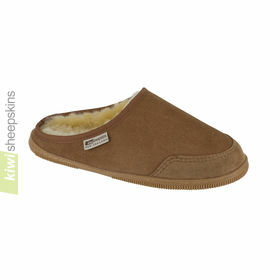 See more testimonials for our Sheepskin Slippers range.